Whether you found us by searching for “apartments for rent near me” or you heard about Summit Riverside Apartments from a happy current tenant, we’re glad that you’re here! We strive to offer the best apartments for rent in Littleton with beautiful finishes throughout. In short, our goal is to provide you with the perfect canvas to make your apartment your ideal living space. One challenge to living in an apartment, however, is keeping things organized. This is particularly true if you’re not a naturally well-organized person! 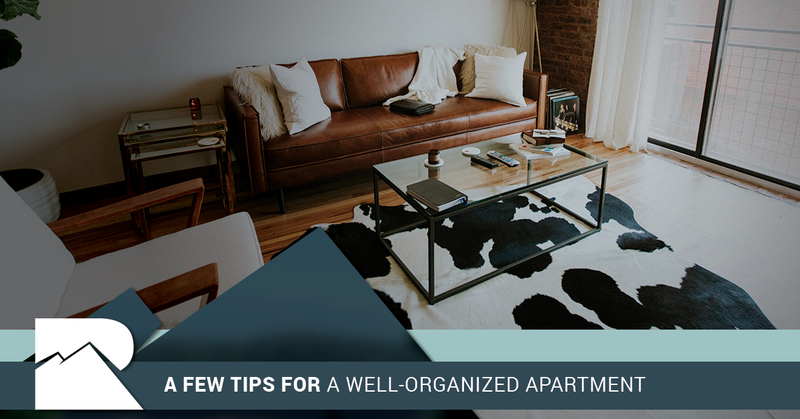 Either way we have a few tips for organizing your apartment that we hope you’ll find helpful in today’s post. Keep reading to learn more! Decorative storage crates are a great way to keep things well organized while also looking great. What’s easier than tucking away unwanted items into a basket? After all, out of sight, out of mind. Sticky hooks are a real lifesaver. When you’re in need of a way to store items quickly and easily, removable sticky hooks can do the trick perfectly. A bonus tip is to place them on the insides of your cabinet doors to maximize storage space. One of the best things you can do to instantly make your space look more well-organized is to hide any cords that are dangling around your apartment. Whether you tuck them behind a desk or purchase a cord hiding tube, it can make a huge difference. What’s better than something that is both fashionable and functional? An ottoman is both and it allows you to have somewhere to rest when you need to kick up your feet. It’s also a perfect place to store remotes, magazines, and the like when you need to tidy up quickly. Whether it’s in the kitchen, a bedroom, or a bathroom, over the door organizers are an easy way to add some storage to an area that would otherwise be wasted space. If you’re the type of person who has quite the collection of plates, glasses, and silverware, one of the best things you can do is to add a decorative shelf inside of your cabinets to instantly double the amount of storage you have. Wire racks (which are easily available at your favorite local big box store) do the trick wonderfully. Last but not least, have you considered tucking the clothes that you’re not wearing under your bed? Simply purchasing a plastic tote, folding up the clothes that are out of season, and tucking them underneath your bed can free up valuable space in your closet and help you to declutter a space that you use on a daily basis. Of course a well-organized apartment is going to look that much better when it has good bones, and thankfully that is the case at Summit Riverside Apartments in Littleton. Unit amenities include stainless steel appliances, full-size washers and dryers, designer flooring, plus carpeting, patios and balconies with extra storage (a must for staying organized! ), walk-in closets, track lights, updated light fixtures, and beautiful dark wood cabinets. In other words, our apartments make for a pretty wonderful place to live. With a friendly pet policy and an amazing neighborhood, our apartment complex strives to the best of the best. Be sure to check out our photo tour to get an idea of what to expect and then contact us today to schedule a tour. We look forward to hearing from you!